The Stokley Family: He is getting WAY to big WAY to fast! He is getting WAY to big WAY to fast! And this one was taken this month at the exact same location! 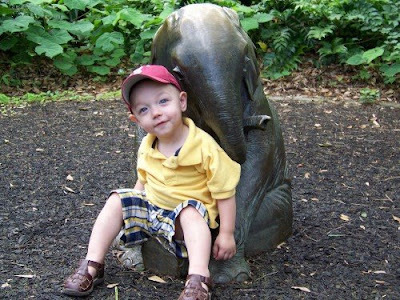 I told Ryan it would be cool if we got his picture taken by this same elephant every year. We go to Baker, LA every year for Ryan's families crawfish boil so we usually go to the Zoo while we are there. On a side note...I plan to start putting things on here again so check back soon!